The Alaska Native Epidemiology Center offers training workshops to build skills in core public health competencies. We also organize and sponsor public health conferences in Alaska. We provide experiential learning opportunities for students through internships, practicum placements, and mentorship opportunities. Training will introduce the principles of effective behavior change communications, social marketing, and health promotion. Topics will include audience segmentation, development of audience-centric messaging and evaluation of campaigns. This two-day training will cover survey design topics including what questions should be asked, choosing the format and writing questions to generate actionable data, identifying the best administration mode, and improving response rates. This 25 minute video will share information on how to respectfully conduct a community health assessment in Alaska Native communities, including building relationships, planning the assessment, analyzing the information collected, and using assessment results to strategize changes to improve community health. The biennial conference provides opportunities to learn about new and emerging issues in maternal and child health and immunization in Alaska. 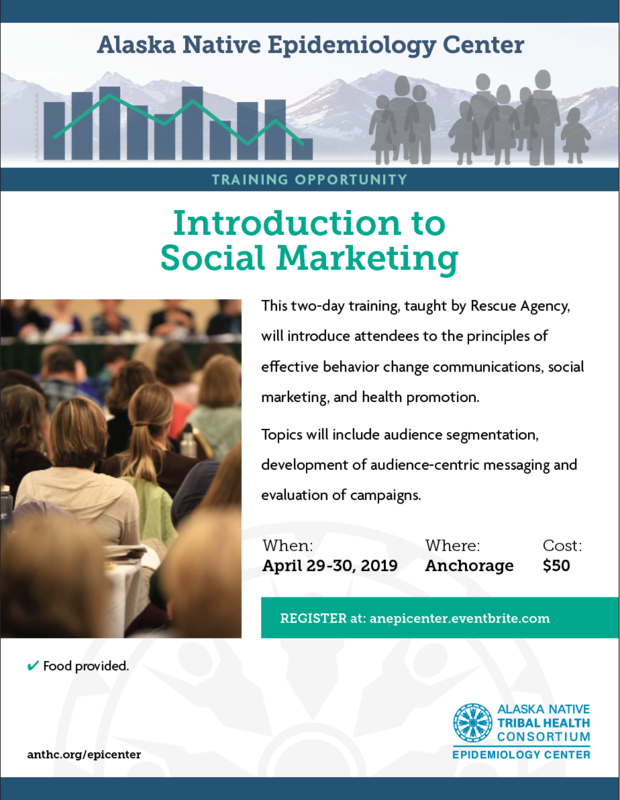 Rural and urban Alaska health professionals come together to learn about best practices and much more. Past conference presentations are archived on the website. The EpiCenter runs several training workshops each year. Past topics have included program evaluation, grants management, health literacy, and many more. We provide scholarships to Alaska Native professionals and students to help build capacity in the Alaska Tribal Health System. Download Adobe Acrobat Reader here to view PDF files.